The eyes of sports fans around the world are fixed on Ukraine this June, but a little corner of that country can also be seen on a Paris wall. A seemingly clandestine plaque commemorating the life of a Ukranian named Urgus Tabarovitch is fixed to the staircase on the Avenue de Camoens in the 16th arrondissement, but did this person ever really exist? 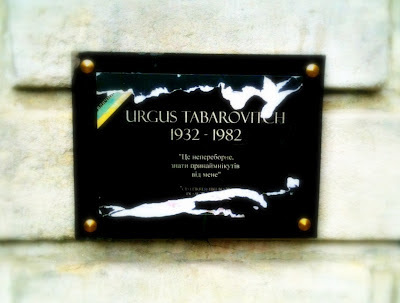 ‘Urgus Tabarovitch, 1932-1952’, reads the plaque, followed by a quotation in Russian (Ukranian?). Translated to French, but partially torn away, all we can see is an enigmatic “C’est l’irrésistible besoin de savoir” (it’s the irresistible need to know) - perhaps a message aimed directly at those attempting to hunt down this mysterious character. A biography for Tabarovitch does exist on the internet, but unsubstantiated online sources are notoriously unreliable. The story though is a fascinating one. Tabarovitch was always something of an outsider. As a young boy he once said to his mother that he “would have liked to have been a bird, to fly, escape and get away from everything”. He developed a passion for art, but with his creations being restricted by a repressive regime, he chose to retreat further towards the margins of society. Flying remained his dream, but he also wondered how flight could somehow be mixed with art. At the age of 19 he designed and built his own biplane, nicknamed turkey, and was delighted when he managed to get it flying in 1952. Although this gave him more freedom, he was still unfulfilled artistically until he began experimenting with his creations in ‘aerial destructuration’. This consisted of a cow’s bladder, inflated with a mixture of paint and gas, that he attached to his flying machines. As he flew, he released the mixture in order to create ephemeral coloured skies, always covering the same space of 4 square kilometres. He continued doing this, producing dozens of variations, until one day in 1982 when his machine crashed in a field near Kiev. During his lifetime he remained unknown – ‘except to his neighbours’ – but his name began to circulate amongst contemporary artists following research into the archives of the ex-Soviet Union by a young Russian student. The story reads a little like an elaborate surrealist hoax, and this sentiment is further heightened by the existence of a micro-blog on the artist’s life. Here we discover (in only four posts) that he was an insomniac throughout his life and rarely slept ‘more than two hours a night’ (when he wasn’t stitching cow bladders), and that he made herbal potions to help him get high and relax. His sleeping problems surely weren’t helped either by the fact that he slept in a bed that was 160cm long, despite measuring 198cm himself! Interestingly, the last post on the blog links to an article that supposedly appeared in French current affairs magazine ‘Le Point’ (dated January 2010), suggesting that a plaque would soon be placed on a wall in Paris, in agreement with the city authorities and a mysterious organisation called the ‘Cercle des poetes disparus’. Why this would happen is not explained. If Tabarovitch did exist, he certainly had no links to Paris, and no particular reason to be celebrated in the city. There seems to be no logical reason either why it would be placed in the 16th near the Trocadero, when the magazine article mentions a possible spot in the Latin Quarter. If Tabarovitch did exist, it is certainly a life that deserves further investigation and celebration. If he didn't, I would like to know who invented him and why! 1) No Urgus Tabarovich (typed in Cyrillic) links found on Google.ru. 2) A very unlikely first name, that is not listed in any Russian-Ukrainian on-line name directories. I think we're definitely leaning towards this being an invention then, but the who and why will probably always be a mystery. Could it be an artistic project, or maybe even a way of passing messages (after all, if British spies in Russia can use a fake rock..)? Good find Jill. Yes, there is now an 'official' Urgus Tabarovitch website: http://urgustabarovitch.com/. I wonder what the link to Aubrey de Grey is. Wikipedia describes him as being "best known for his view that human beings could, in theory, live to lifespans far in excess of that which any authenticated cases have lived to today". Is this significant, or was he just chosen at random? I think that the answer will be found by investigating the 'Cercle des Artistes Disparus', apparently joint creators of the site. By investigating who bought this site's domain name I have found a street address in Paris and an e-mail address. I'll see where that leads me! Good luck with the further investigations! I think the photo of Dr Grey was just chosen because with the beard and the beer he looks rather Ukrainian, but maybe there is a link. In any event it shows a certain amateurishness, to choose a picture of a fairly well-known person to masquerade as your hoax artist. BTW, isn't Cercle des Artistes Disparus the French name of the Robin Williams film, Dead Poets Society? Or maybe that's another red herring. I'm wondering how you came upon this plaque. Did you stumble upon it or did you go looking for it? Hi Andy - like most of my 'discoveries', I stumbled across it. As there is a book by Urgus (http://www.amazon.fr/Artiste-Ukrainien-Ukrainienne-Architecte-Musicien/dp/1159387168/ref=sr_1_1?s=books&ie=UTF8&qid=1345368723&sr=1-1), maybe he really existed (even if i think that his life was quite romanced). Today's article on the online student newspaper of the school i'm currently doing an exchange in. So the event is tomorrow huh? I have a few facts in hand which might help you. Urgus tabarovitch is a hoax created by a friend to use for false quotations in philosophy assignments(which is mandatory in France in high school in "classe de terminale"). He really got into it and created false websites, and put this in the 16ème, near or old high school. Anonymous: this then is the definitive answer. I would be quite interested to meet the person behind this hoax though. If you ever pass through here, do send me a mail! A great internet mystery still unraveling. Keep us posted please. This is a good one and seems more than a high schoolers prank unless getting plaques put up in Paris is easily done. Another indication of this being a hoax is that the text in Russian on the urgustabarovitch.com site is actually a description of a "One-volume legal dictionary, holding more than 7000 words and expressions (etc)"
I just read this article, after reading the one about "Villa des Ternes". And after doing a google maps search, I found a "Urgus Tabarovitch Island, Municipality of Hadji Panglima Tahil, Région autonome en Mindanao musulmane, Philippines", additionnally to the one in romania already mentionned in previous comments. Seems the 'Cercle des Artistes Disparus' are really influent.